Ideal for 1-2 people, free C&C and good reviews. Use code 10MVC at checkout. Prepare a meal for up to 2 people using the 1.5L slow cooker from Daewoo. You can switch it on in the morning, head to work or simply get on with chores while your meal cooks away. The slow cooker has three heat settings to give you extra versatility when you cook and is completely safe to leave switched on, even when you’re not at home, so your food will be ready when you are. Tempered glass lid – allows you to take a peek at the food without having to remove lid. 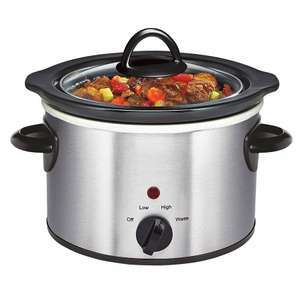 Cool touch housing – means you cantouch the slow cooker assured that you will not burn yourself. Manual temperature control – adjust temperature as needed.